BREAKKY TACOS, HORCHATA ICED COFFEES, AND MORE! NO-FRILLS MEXICAN BAR AND DINER. vego SERVING BUT meat FRIENDLY. BROTHER OF MAMASITA. FOR NO-FRILLS MARKET-INSPIRED SNACKS WITH MEZCAL AND TEQUILA, tap BEERS AND COCKTAILS. TACOS AND TOSTADAS with shared plates INSPIRED BY NEIGHBOURHOOD TAQUERIAS AND MARKET TOSTADERIAS OF MEXICO. HIDDEN IN A HERITAGE POST OFFICE ON SMITH ST IN COLLINGWOOD. 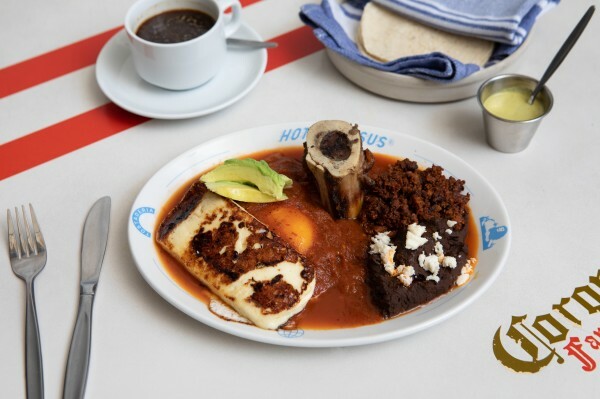 OUR MENU HAS RE-IMAGINED CLASSICS, REVOLVING seafood ceviches AND GUISADOS (SLOW COOKED MEATS), AND PROBABLY A BUNCH OF DISHES YOU MIGHT NOT HAVE HEARD OF. TACO TUESDAZEs 5.30pm till sold out! OUR WEEKEND BREAKFAST MENU IS A HYBRID OR AUTHENTIC MEXICAN DISHES ALONG WITH A SELECTION OF BREAKFAST TACOS MORE COMMONLY FOUND IN LA AND TEXAS. FROM HEARTY DISHES SUCH AS THE OAXACAN FEAST THROUGH TO CLEAN HEALTHY AND LIGHT DISHES SUCH AS THE MELON CEVICHE AND AZTEC GRAIN SALAD. A CONCISE HEALTH KIDS MENU IS ALSO AVAILABLE. OUR DINNER MENU IS FOCUSSED AROUND AUTHENTIC MEXICAN CUISINE. WE PREFER TO EXPLORE THE FLAVOURS OF MEXICOS BOUNTY OF INCREDIBLE CHILIS, HENCE MANY OF OUR DISHES ARE MORE MILD THAN HOT. IF YOU'D LIKE TO SCALE UP THE HEAT, ASK FOR OUR SALSA DIABLO. WE CUSTOMISED AN ICE WELL TO ENSURE OUR CERVEZAS AND MICHELADAS WERE SERVED AS COLD AS WE COULD GET THEM. WE ALSO TAKE PRIDE IN SERVING THE BEST MARGARITAS IN TOWN ALONG WITH A CONCISE LIST OF OUR FAVOURITE MEZCALS. OUR WINE LIST FAVOURS WINES THAT SUIT THE FOOD AND OUR LOCAL CLIMATE. WE ALSO HAVE AN EXTENSIVE NO ALCOHOL LIST OF MOCKTAILS, HOUSE MADE SODAS AND TRADITIONAL MEXICAN BEVERAGES. Hotel Jesus accepts bookings and walk ins. On Taco Tuesdaze we accept bookings for banquet menus only ($38 or $48), all other tables are available for walk ins. If you wish to order our Taco Tuesdaze $2 tacos in addition to your banquet please ask your server. If you do not wish to have our banquet menu please come as a walk in. We have a semi Private Dining Room that can accommodate up to 18 guests, or 20 with a squeeze. All bookings of 8+ are required to go on either the $38 or $48 banquet menu. We have a vegetarian and / or vegan banquet to suit. Please contact our reservations team to find out more. We also have a 'self serve fridge' that can be filled with beer, wine or sangria, just let us know your preference. Our menu is 90% gluten free. Other dietary requirements are happily accommodated where possible. Please be sure to make note of any food allergies or dietary requirements at the time of booking.